As a wildlife pathologist and disease ecologist, Nicole is fascinated with the theoretical and applied ecology of infectious diseases, particularly multi-host vector-borne pathogens, in the context of anthropogenic environmental change. She is also interested in understanding the effects of pathogens on wildlife populations, ecosystem structure and function, and has a particular obsession with Neotropical flora and fauna. ​Johan is a biologist from the Universidad Nacional de Colombia. During his bachelor studies, he worked with the genetics of Afro Colombian populations, and during his masters, with chemical ecology of plant-herbivore interaction in Physalis peruviana plants. Currently, he is doing his doctoral project about disease ecology of Chagas disease. His specific interest is about palms as sites for the establishment of Rhodnius prolixus populations (the main vector of Chagas disease in Colombia) and for the transmission of Trypanosoma cruzi. For this research, he is determining the main palm tree characteristics related to vector presence and abundance, and the effect of vertebrate community associated with palms on the T. cruzi infection of vectors. ​Maria earned a BS and a Licentiate in Biology, and a MS in Field Epidemiology from Universidad Del Valle de Guatemala. She has participated in different research projects, including studying the mosquito abundance, infection rates and feeding patterns of potential vectors of arboviruses, and studying the epidemiology of wild bird, swine and human-origin influenza A viruses in Guatemala. 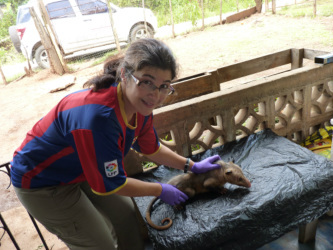 Maria's research interests include the ecology of vector-borne and zoonotic diseases, multi-host and multi-vector systems, landscape ecology, and the impact of habitat disturbance in disease dynamics. ​Yaravi is a Panamanian biologist with an undergraduate degree from the University of Panama. Yaravi has a background in microbiology, parasitology, and bioprospecting. She has collaborated in different projects working with Chagas disease, Toxoplasma gondii, and aquatic fungal isolation-identification. Kaylee Arnold, raised in San Diego, CA, earned her BS in Biology from the University of Redlands (Southern California) in 2013. In the fall of 2015 Kaylee went back to school to pursue her MS in Ecology and Evolutionary Biology at Tulane University (New Orleans) and graduated in May 2016. During her Master’s research she worked in the Van Bael Lab and studied baldcypress tree endophytes. Kaylee’s current research interests include understanding the effects of anthropogenic stressors on gut microbiomes and how landscape changes affect pathogen transmission between animals. As a new IDEAS student Kaylee will be working with Dr. Nicole Gottdenker and Dr. Michael Strand. Christina has a BS in Wildlife Biology from Humboldt State University. Her research interests include understanding the impacts of anthropogenic land use change on pathogen transmission and host-parasite interactions within ecological communities. Christina's current research focuses on the Chagas disease vector, Rhodnius pallescens, and the relationships between food web community/structure and R. pallescens abundance and population structure. By incorporating disease and food web ecology with network modeling, she aims to determine whether there is a significant relationship between food web community/structure, vector abundance, and vector infection with Trypanosomes in central Panama.